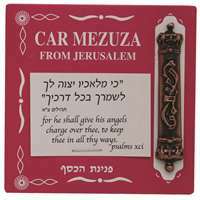 This compact car mezuzah is viewed by many as a symbolic charm for protection when on the road. The mezuzah contains the traditional prayer that is attributed for safety of the wayfarer. This copper car mezuzah case is decorated with the Hebrew letter “Shin Daled Yud” and with a crown on top. Great for a “car warming” gift or for personal use.